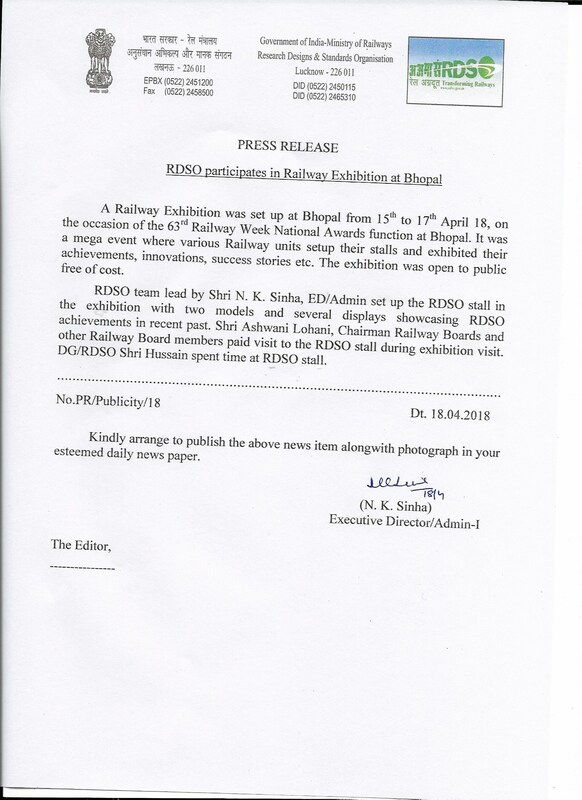 A Railway Exhibition was set up at Bhopal from 15th to 17th April 18, on the occasion of the 63rd Railway Week National Awards function at Bhopal. It was a mega event where various Railway units setup their stalls and exhibited their achievements, innovations, success stories etc. The exhibition was open to public free of cost. RDSO team lead by Shri N. K. Sinha, ED/Admin set up the RDSO stall in the exhibition with two models and several displays showcasing RDSO achievements in recent past. Shri Ashwani Lohani, Chairman Railway Boards and other Railway Board members paid visit to the RDSO stall during exhibition visit. DG/RDSO Shri Hussain spent time at RDSO stall.